Wineskin or bota bag las 3 Z.Z.Z. mini size with latex inside and straight shape, is made by hand with top quality goatskin, clean of stains and cuts, tanned following a traditional process. Sewing of the boot reinforced by triple sewn. Made in Spain. It is a tradition to give as a present when a baby is born. 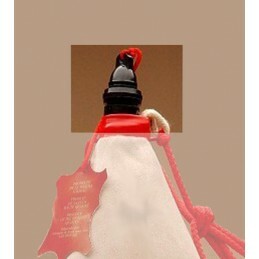 It is a wineskin made of genuine goatskin top quality, clean stains and cuts, reinforced with triple stitched sewn. The upper bung opening of closure is made of bakelite, fully sealed. Interior Waterproofing in latex. Drawstring shoulder. There is the possibility of producing custom made boots classic model of higher capacities: 5, 6, 8, 10, 12, 15 and 20 liters.